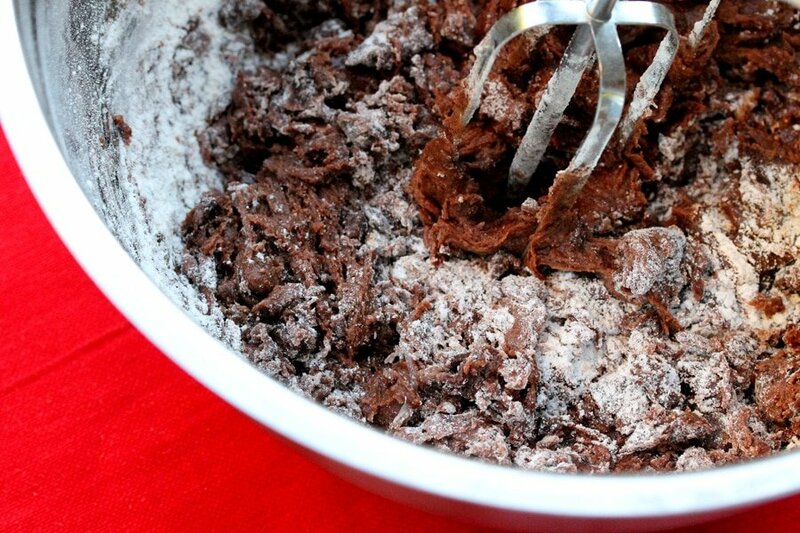 I love how pretty brownies look with a dusting of powdered sugar. 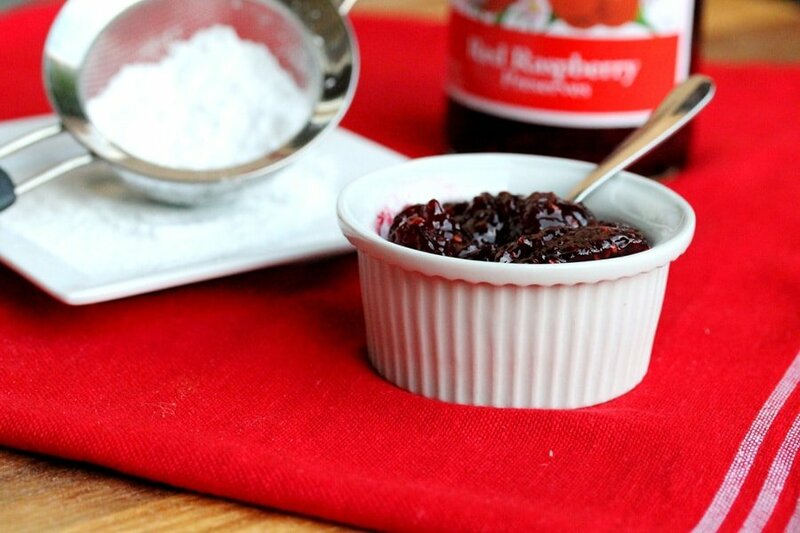 And I love how pretty raspberry jam looks when it’s in powdered sugar desserts. So why not make a recipe with all of these goodies. These brownies are made in a mini muffin tin and taste really delish with raspberry jam. 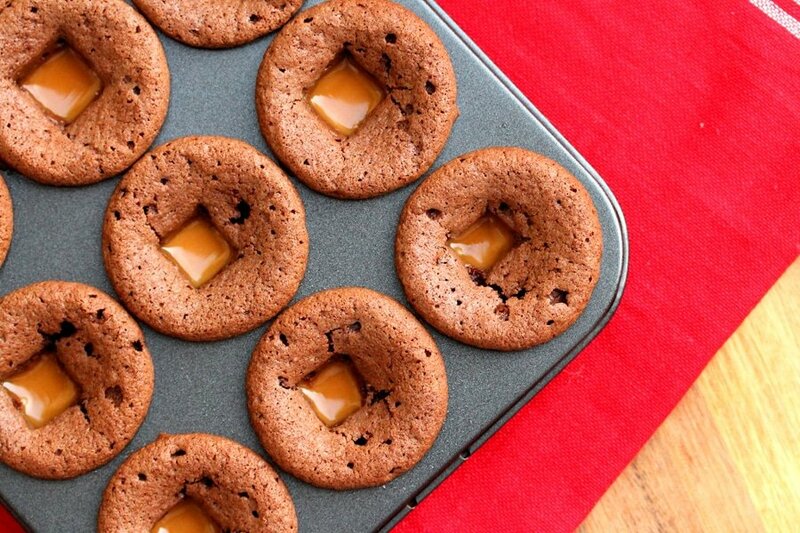 But one more thing….since caramel goes good with chocolate, this recipe also includes an option of adding caramel candies in the middle of the brownie bites. 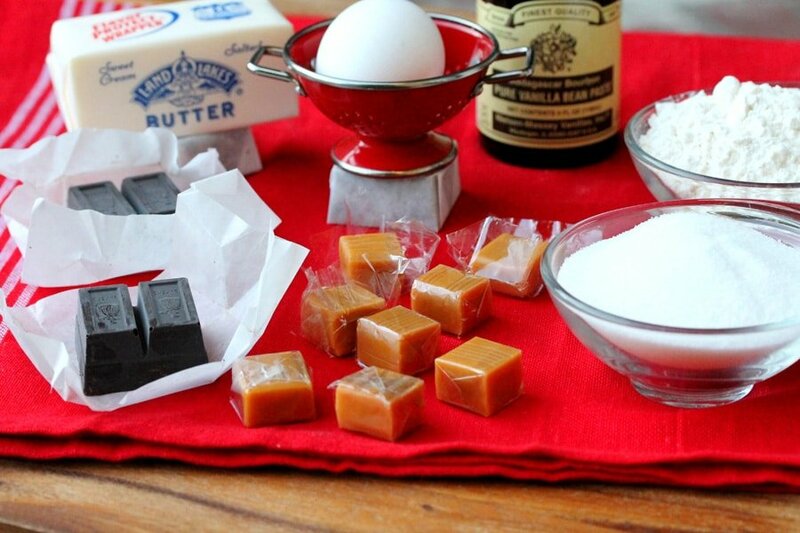 Unsweetened chocolate squares, butter, eggs, vanilla extract (vanilla bean paste is pictured here), sugar and flour….caramels are optional. 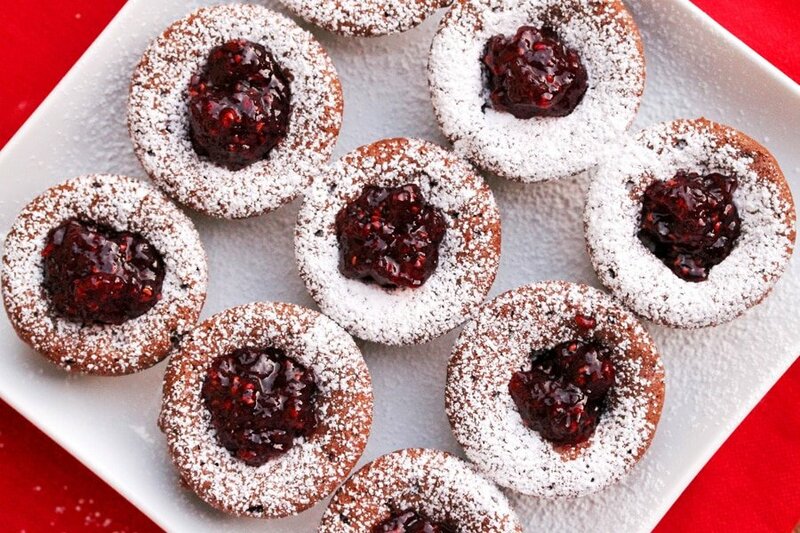 Raspberry jam (or your favorite flavor)..and powdered sugar. 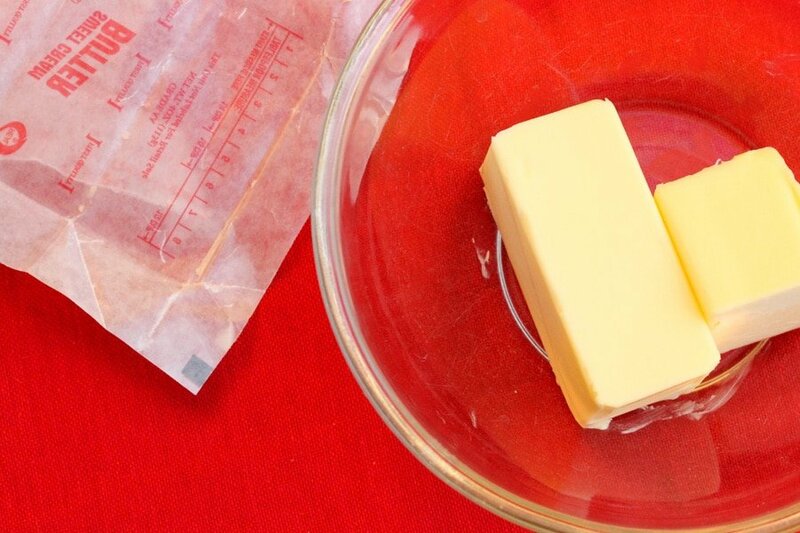 Add the butter to a medium size bowl that can go in the microwave. 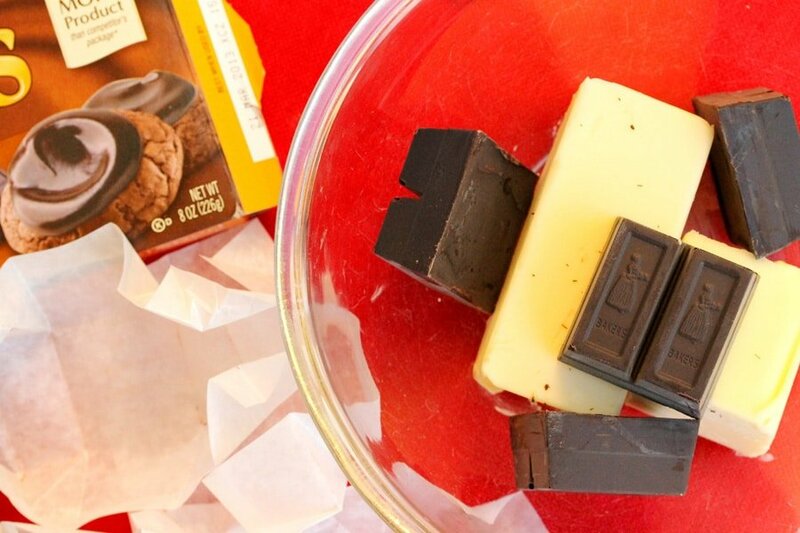 Cover the bowl with a paper towel and heat the butter and chocolate in the microwave for about 90 seconds or until the butter is melted. 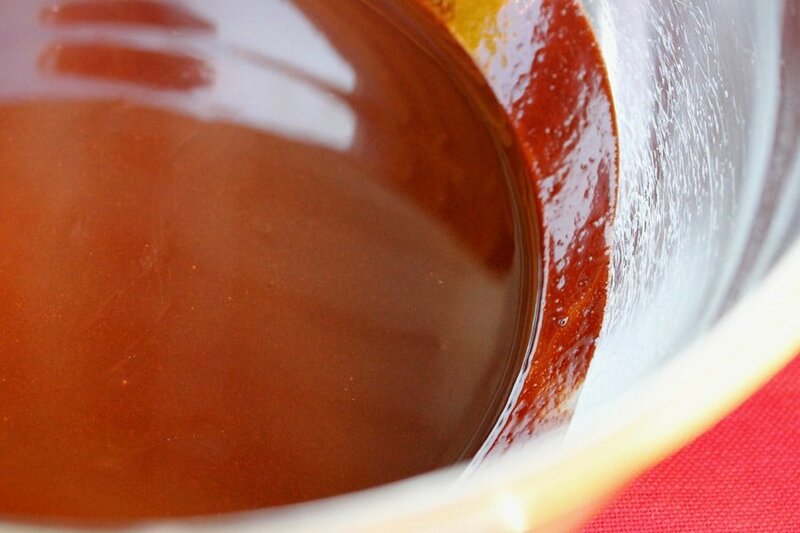 Stir together until the chocolate is completely melted. I transferred the melted chocolate to a bigger bowl because I like to use a small glass bowl for cooking things in the microwave. But it’s not quite big enough for all of the other ingredients. 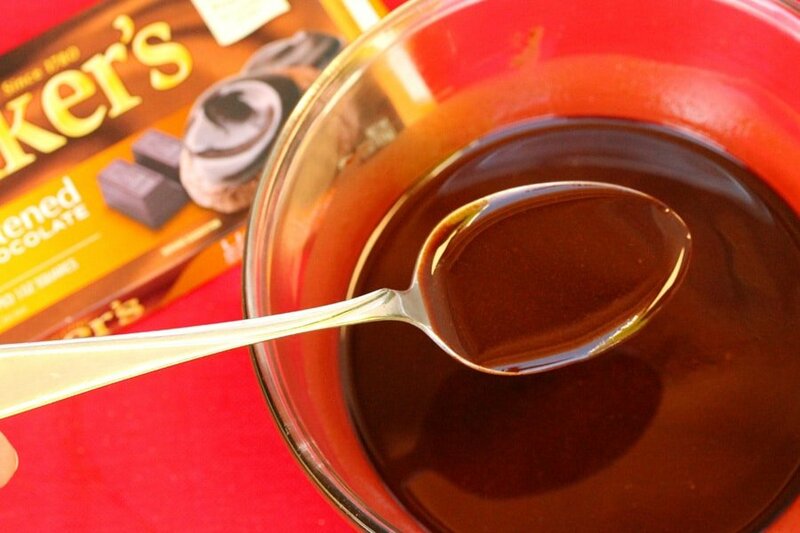 ….and stir the sugar in with the chocolate mixture. ….and the vanilla extract ….then stir (this is actually vanilla bean paste that I used instead). 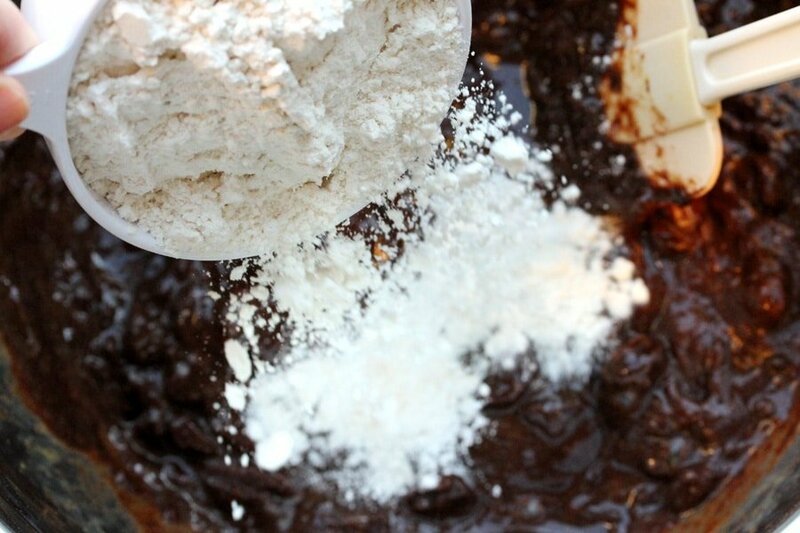 Then use a mixer to blend all of the ingredients together. 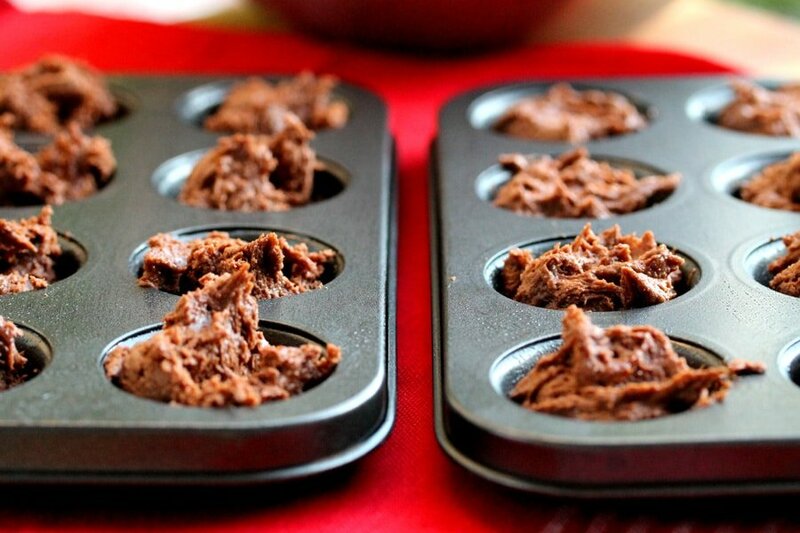 Spray the mini muffin tins with cooking spray. 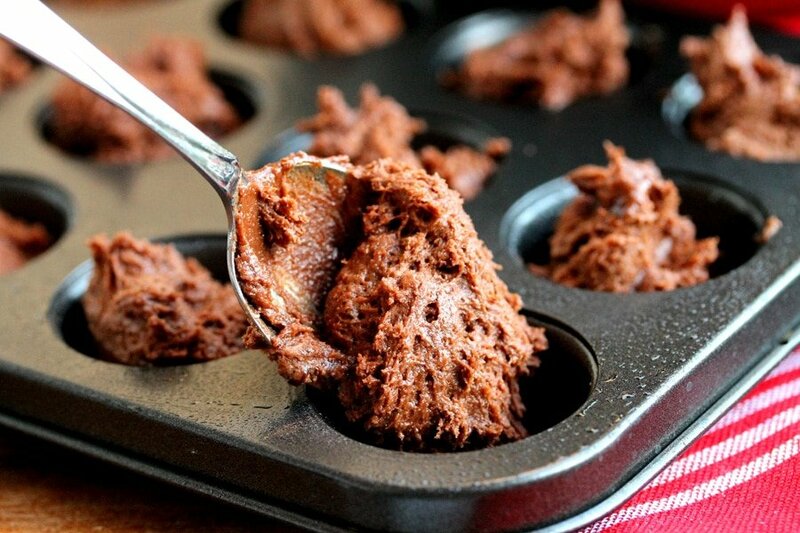 Add the batter to the mini muffin tray. 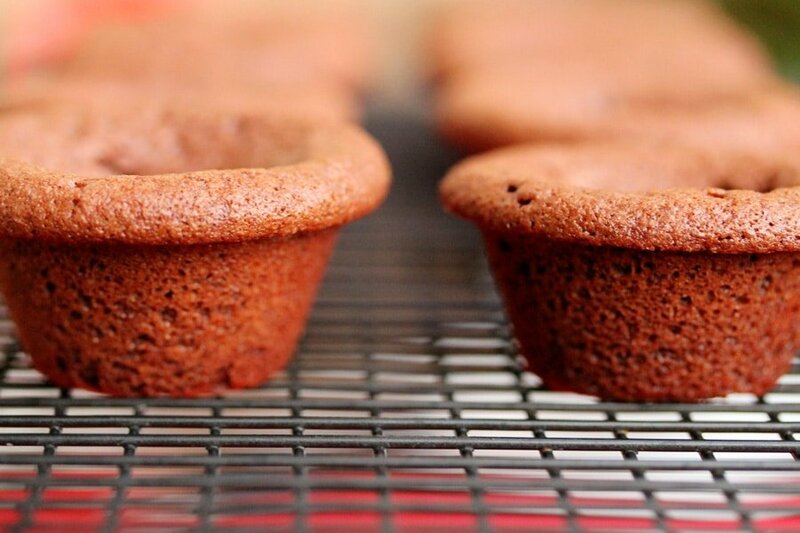 The batter is on the thick side so it’s ok if there’s some empty space around the batter for each muffin. 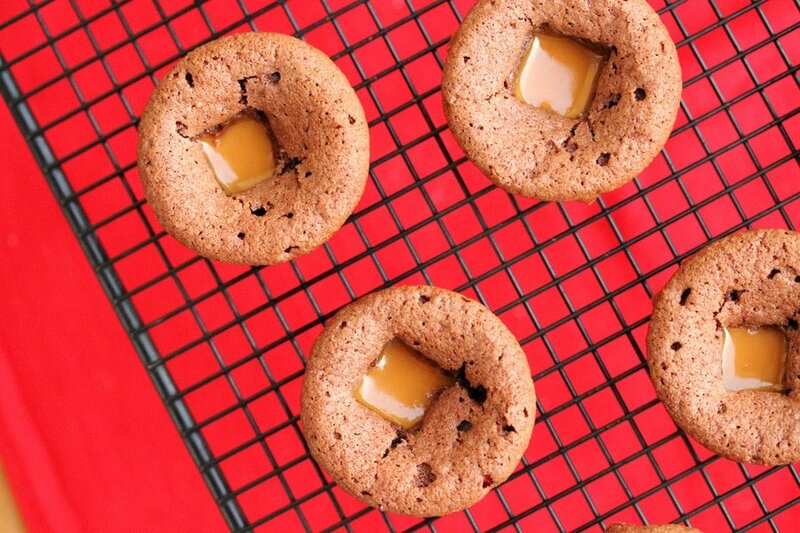 Add a caramel candy in the middle of the batter for each muffin (optional). …..making sure not to push it down all of the way to the bottom of the muffin. 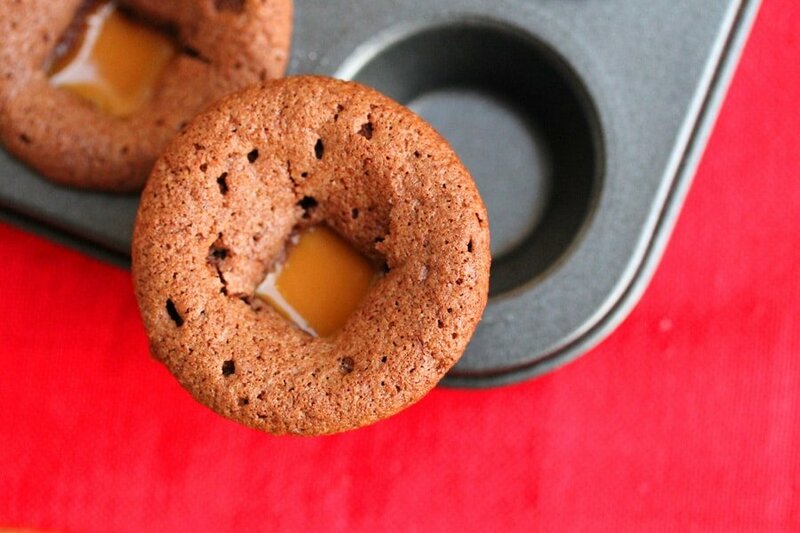 The batter needs to be touching the bottom of the muffin tin so that it will form a “bowl” to hold the melted caramel. 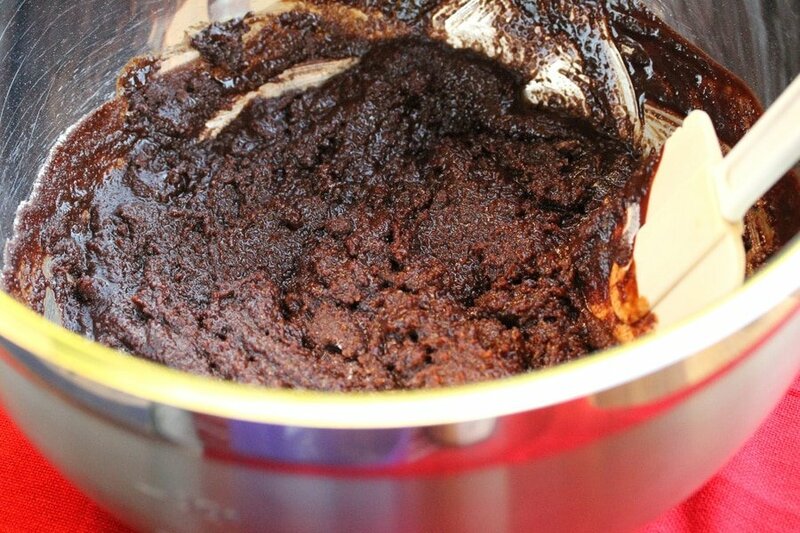 Bake in a preheated oven for about 8 to 10 minutes or until a toothpick inserted in the brownie section comes out with fudgy crumbs. Watch them closely so they don’t over bake. 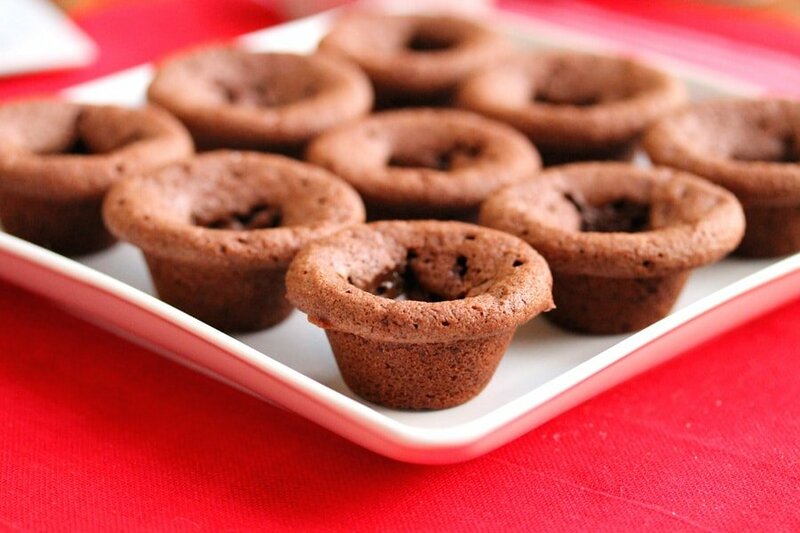 The trick is to bake them just enough so that the brownie is still moist. 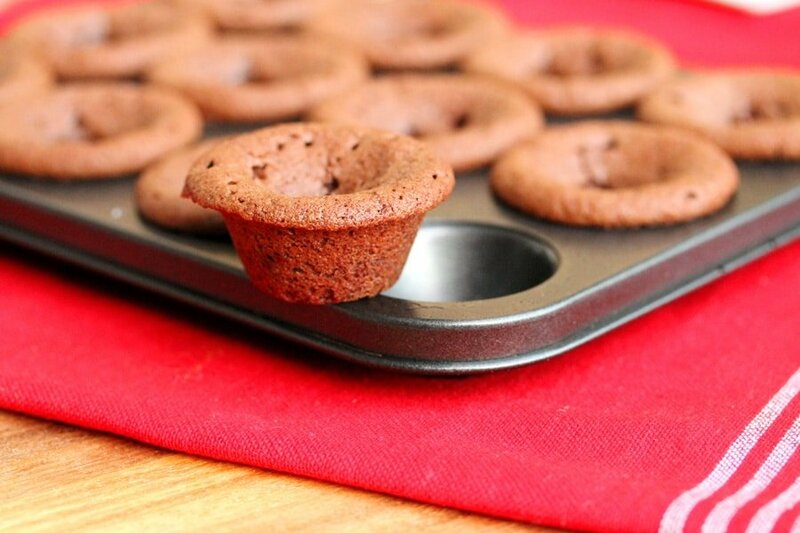 When finished baking, gently lift the brownie bite out of the pan and cool them on a rack. They should lift out easily. 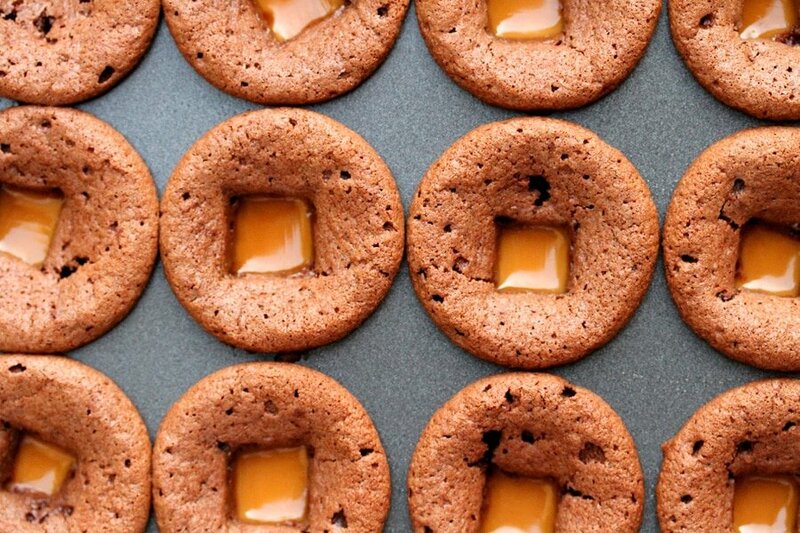 You don’t need to cool them on the rack too long…..
Just about 8 minutes so they keep their shape, particularly if the caramel is in the middle. 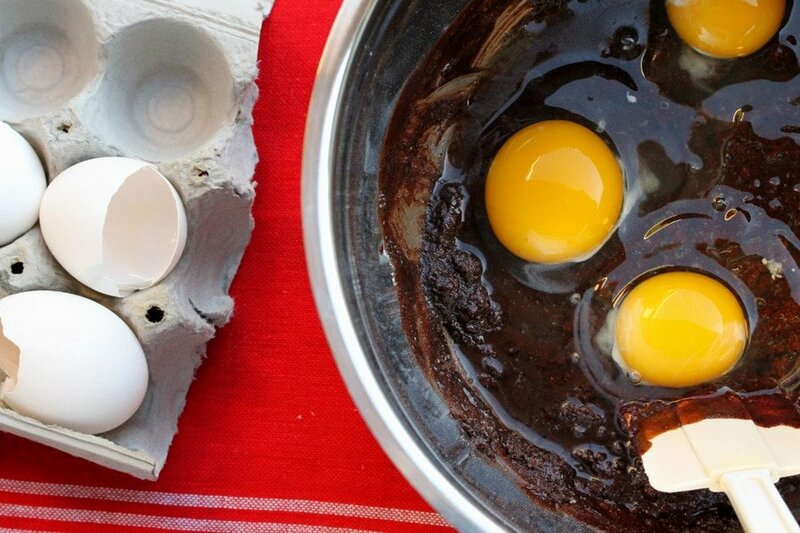 When the brownies are still warm, put them on a plate…. 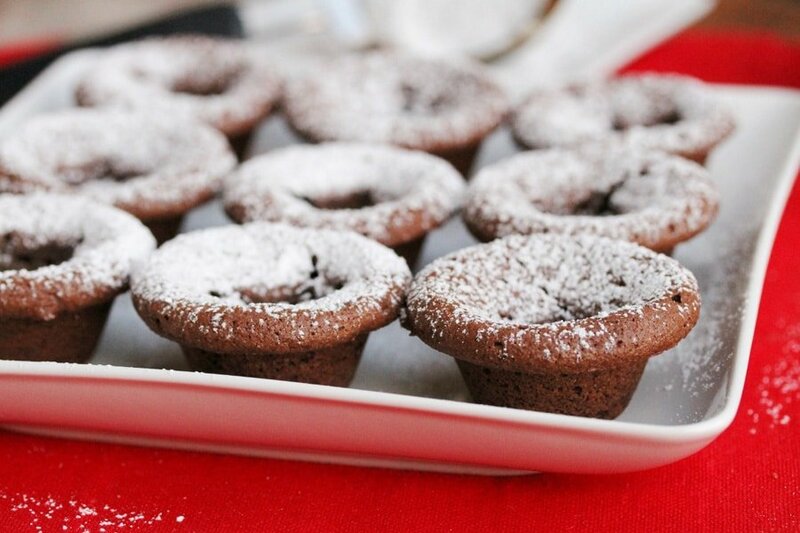 ….that’s big enough to dust them with powdered sugar. 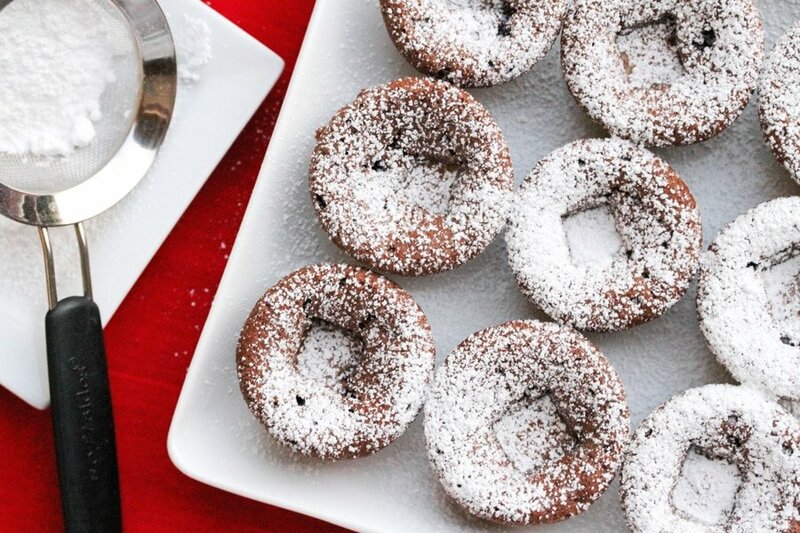 Then, dust them with powdered sugar. 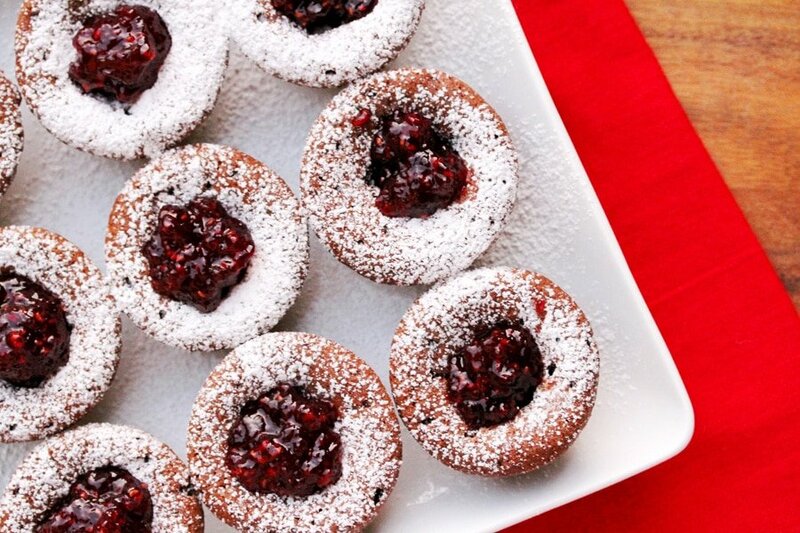 I like to add a good amount of powdered sugar…. ….so that the tops are white but you can still see a little bit of the brownie color showing. 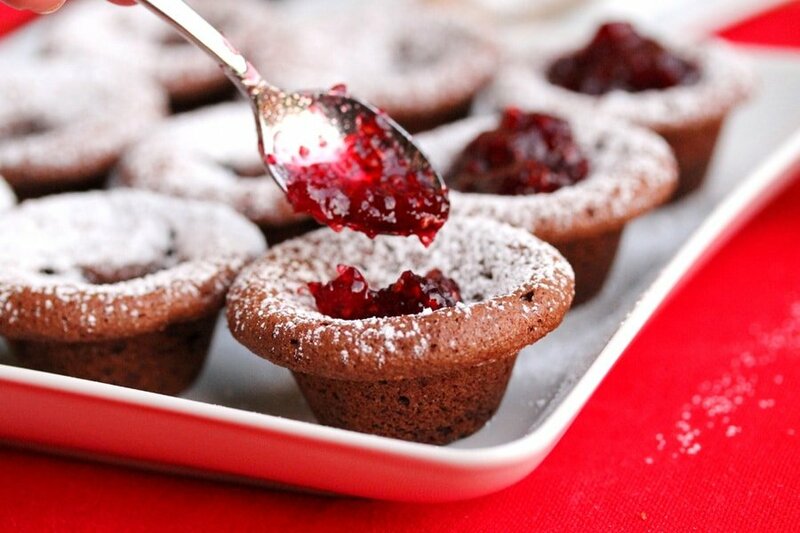 Lastly, add a small spoonful of raspberry jam to the middle of the brownie bite. 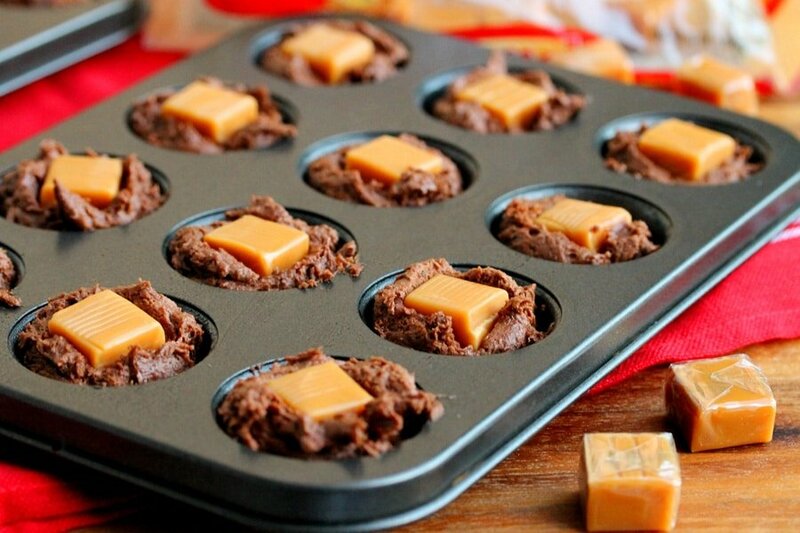 If you make these brownie bites with the caramels; when completely cooled, the caramel is very chewy……. 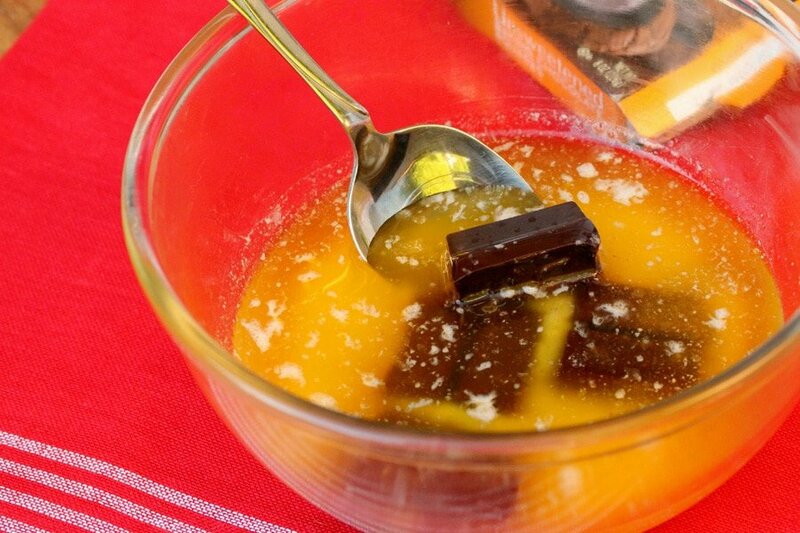 So before serving, put them in the microwave for a super quick 5 seconds, not too long or the caramel will get too hot and burn your tongue. Chocolate, raspberry and caramel with each bite. 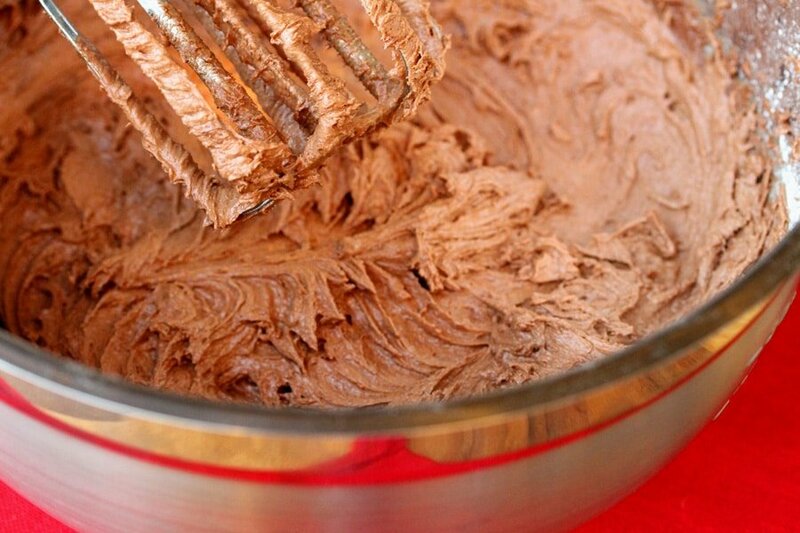 For the Chocolate - To a medium size microwavable bowl, add butter and chocolate. Cover the bowl with a paper towel and heat in the microwave until the butter is melted (about 50 seconds). 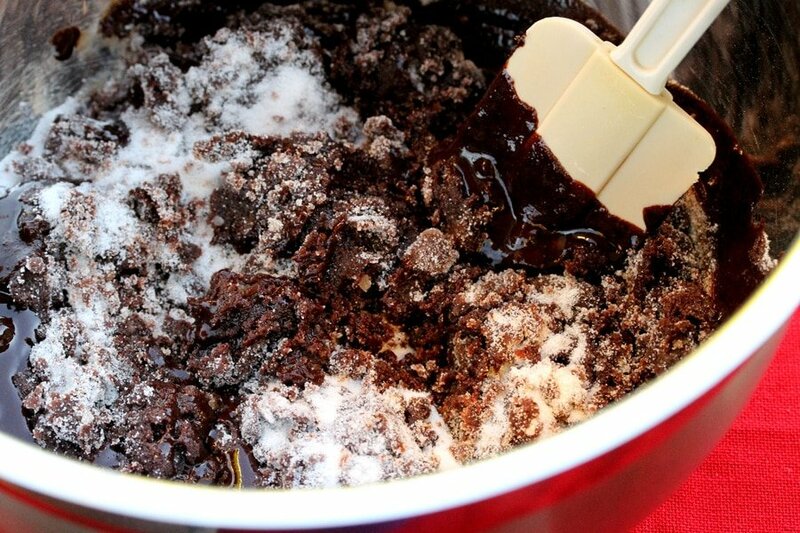 For the Brownie Batter - Stir in the sugar. 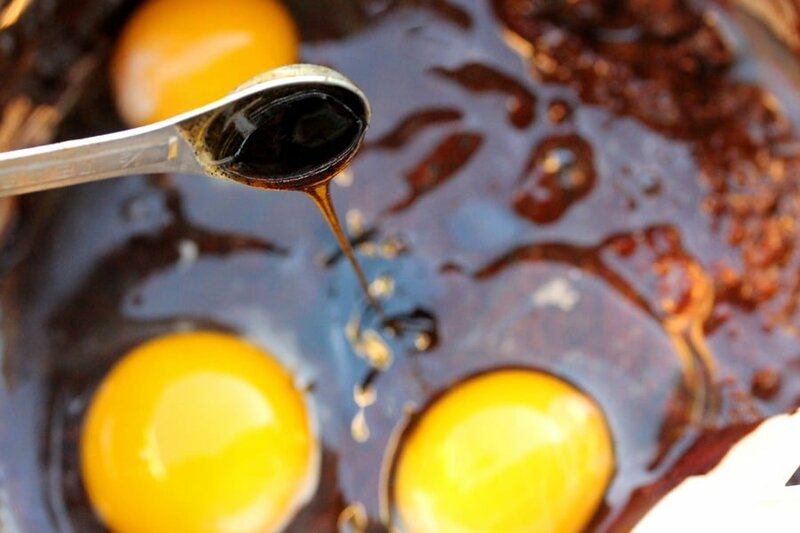 Add the eggs and vanilla extract. Stir the ingredients together. To the bowl, stir in the flour. 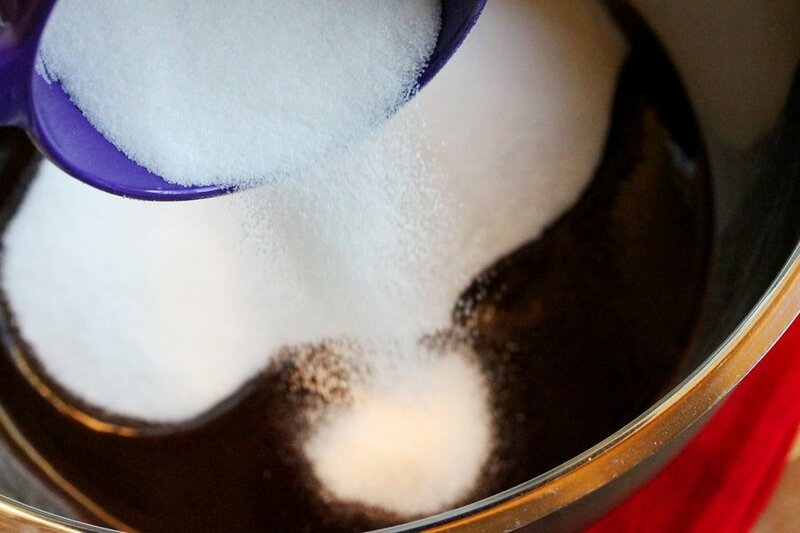 Use a mixer to blend all of the ingredients together and set aside. 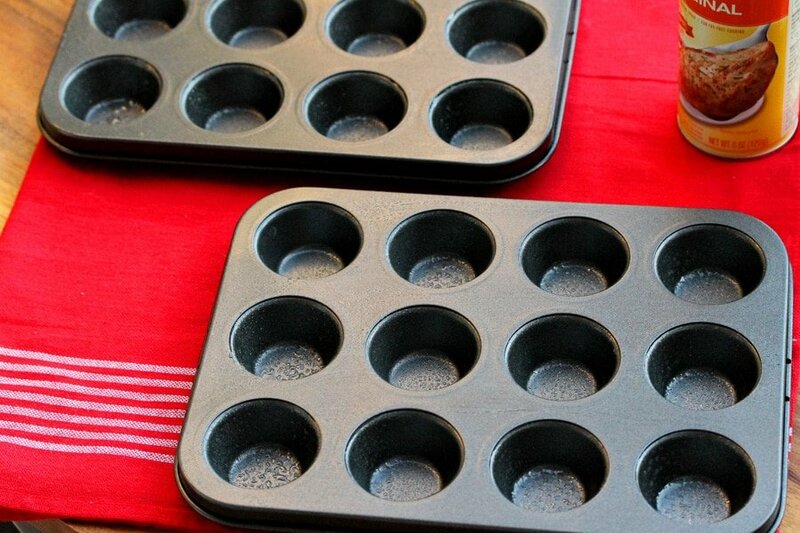 For the Muffin Pan - Spray the mini muffin tins with cooking spray. Add the batter 3/4's full in each cavity. 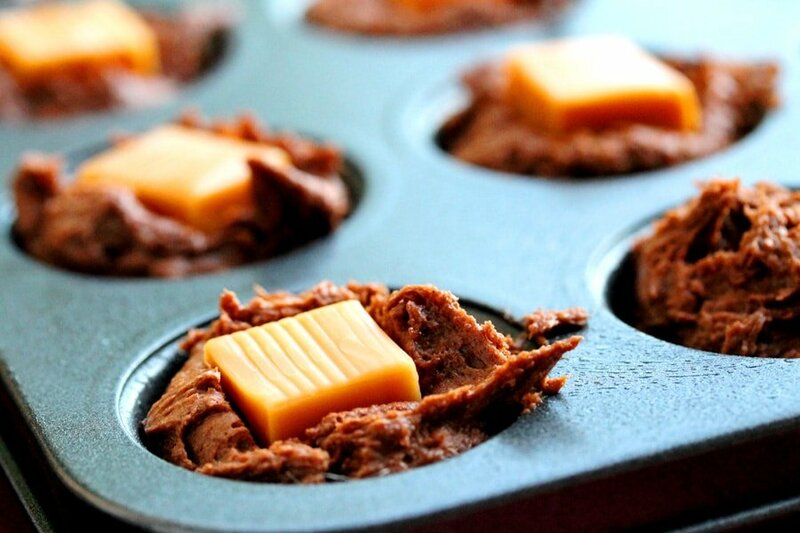 In the middle of the batter for each muffin, add a caramel candy (optional). 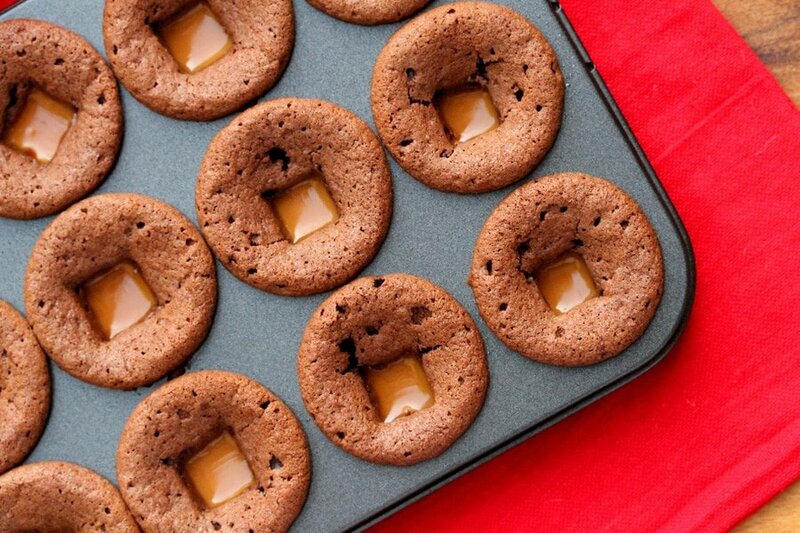 Gently push the caramel candy in the middle of the batter just a little bit; making sure not to push it down all of the way to the bottom of the muffin. Bake in a preheated oven until a toothpick inserted in the brownie section comes out with fudgy crumbs (about 8 to 10 minutes). 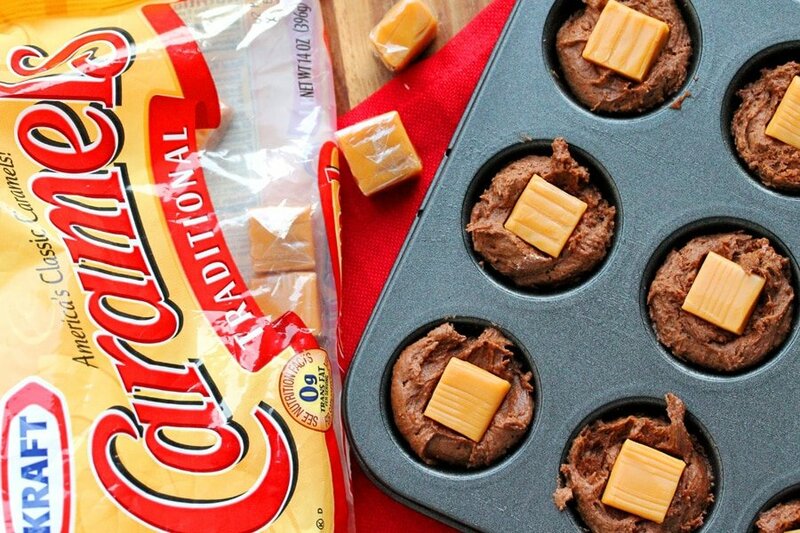 Watch them closely so they don’t over-bake. When finished baking, gently lift the brownie bite out of the pan and cool them on a rack for 8 minutes. 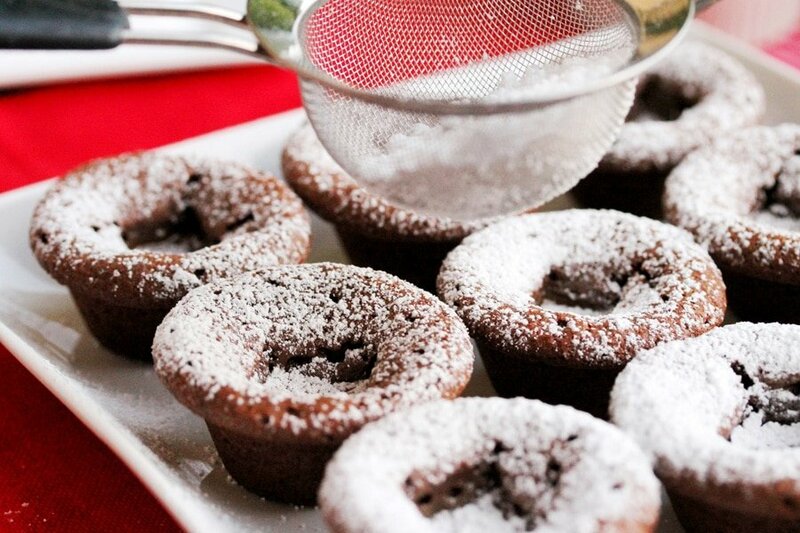 When the brownies are still warm but not too hot to handle, put them on a plate and dust them with powdered sugar. 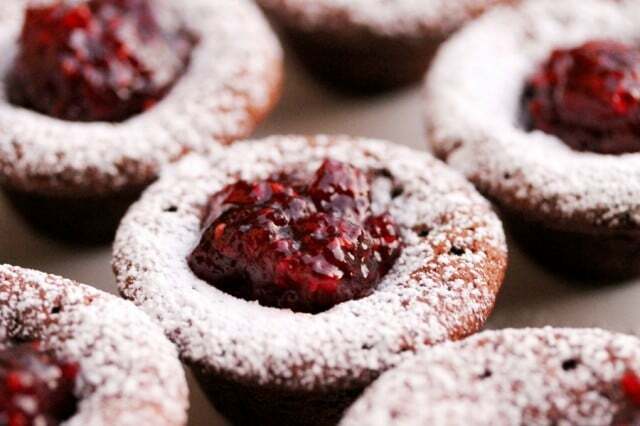 Lastly, add a small spoonful of raspberry jam to the middle of the brownie bite. Serve warm. 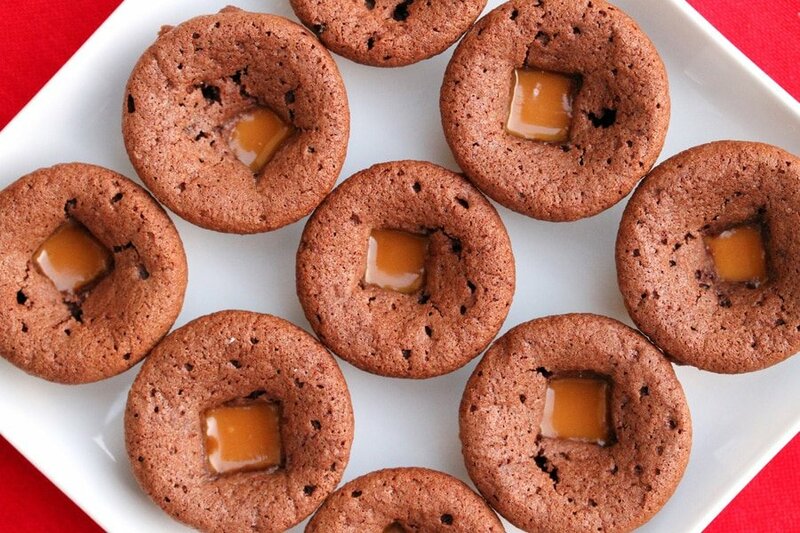 If these brownie bites were made with the caramels; when completely cooled, the caramel is very chewy so before serving, put them in the microwave for a super quick 5 seconds (not too long or the caramel will be too hot to eat).